Restaurants serving millet based food are on the rise today. 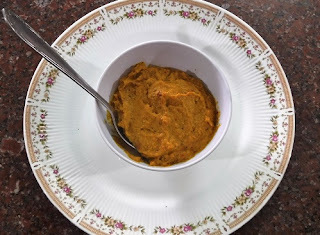 Most of the eateries in Karnataka have always been serving Ragi Muddae Oota since a long time. After the rise of the millets in the urban scene Ragi Soup has become the in- thing in food courts of corporate offices. 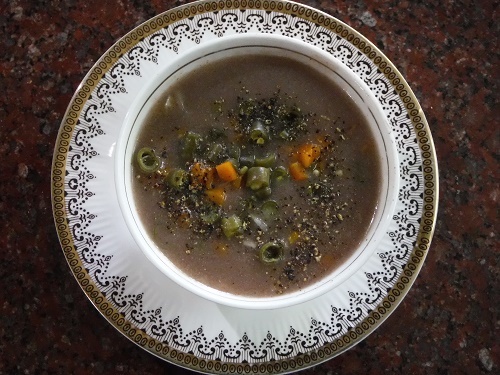 Traditional Ragi Kanji turns into a nutritious Ragi Soup with the addition of vegetables! 1. 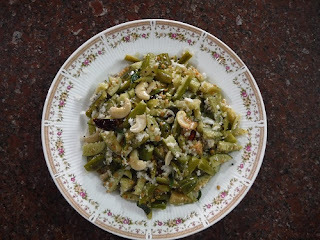 Steam cook the finely chopped vegetables till al dante. 2. Heat oil in a pan and fry the onion slivers till they turn golden brown. 3. Add crushed ginger and garlic and fry till it gives out a pleasant aroma. 4. 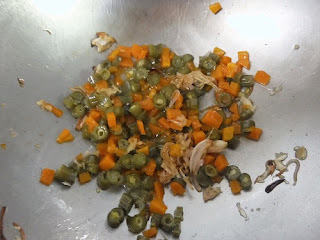 Add the steamed vegetables and saute for two minutes. 5. Pour the two glasses of water into the pan and bring it to a boil. 6. 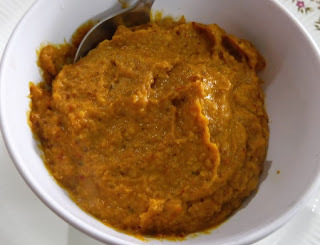 Mix Ragi flour with little water to make a paste and stir it into the boiling water. 7. 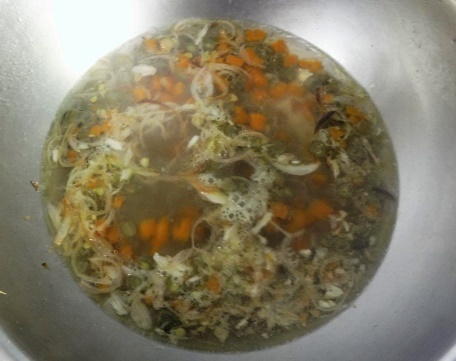 Stir and cook till it turns shiny and reaches a thin soup consistency. 8. Mix in salt and turn off flame. 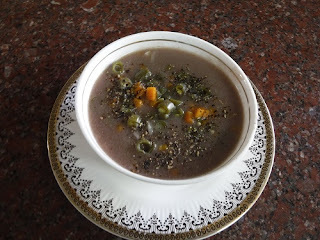 Garnish with crushed pepper and enjoy the Vegetable Ragi Soup while it is hot. You may add a dash of Tomato Sauce or Chilly Sauce if you wish to. Thin Vegetable Ragi Soup with the crunch of crushed pepper is a healthy and appetizing starter.Where as a thick soup becomes a healthy meal in itself. Ever since the Portuguese brought Cashew to Goa, cashew nuts have become an integral part of the traditional recipes of the Konkan Coast. 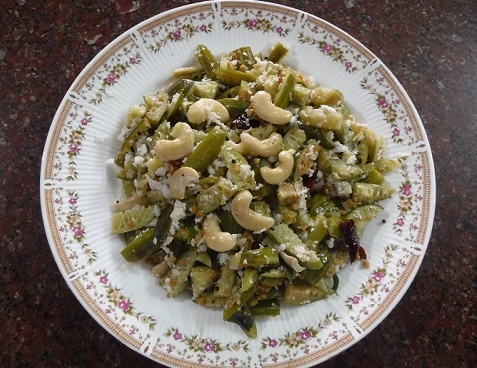 Godambi Tondekai Palya (Cashew nut and Ivy gourd Curry) is my family's favourite after tasting it at a Mangaluru wedding lunch. There is always a rush to procure tender raw cashew nuts which are available only during the season. Since I prepare this curry often I use the normal cashew nuts which are readily available in the market. 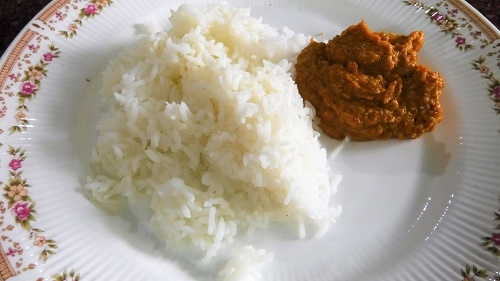 A tender texture can be obtained by soaking the cashew nuts in warm water for at least half an hour before making the curry. 1. 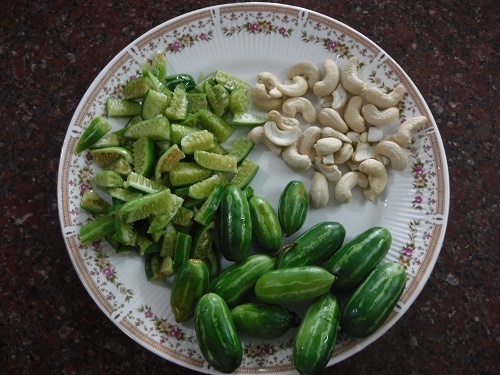 Soak cashew nuts in warm water. 2. 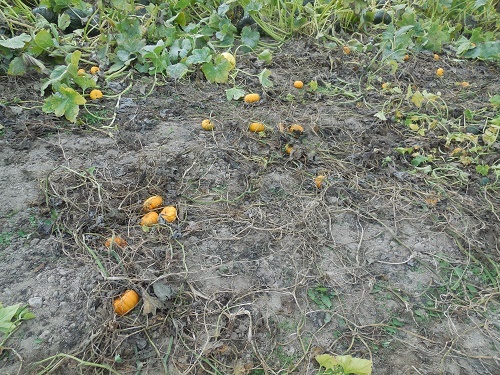 Wash and slit the Ivy gourds/Tondekai length wise into 4 or 6 pieces. 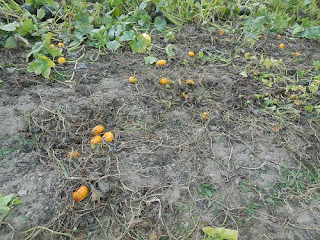 Cut them across if the gourds are too big. 3. Cover the chopped Ivy gourd/Tondekai in water, add salt and cook till just done without allowing it to become mushy. Drain if there is excess water. 5. 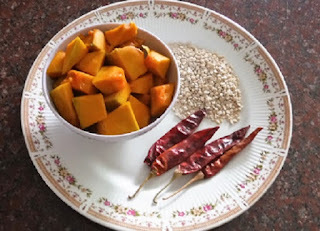 When the mustard splutters add split black gram dal and fry till it turns golden brown in colour. 6. Decrease heat and add the broken red chillies, asafoetida and curry leaves and stir well. 7. Add the cooked Ivy gourd/Tondekai and mix well with the seasoning. 8. Drain and add the softened cashew nuts and stir together till the curry becomes dry. 9. Mix in the fresh coconut gratings and switch off flame. Enjoy the Mangaluru special Godambi Tondekai Palya with any meal.